With The Muppets arriving on Blu-Ray and DVD, Movie Fanatic scored an exclusive interview with two of its stars, new Muppet Walter and the veteran Muppet, Fozzie Bear. The film, written by star Jason Segel and Nick Stoller, brought back the iconic characters and also introduced them to a whole new generation. Be sure to check out the film on home video and enjoy our chat with two of the film’s stars! Movie Fanatic: Walter, what does it mean to you to be part of the big screen return of The Muppets? Walter: It means everything to me! If it wasn’t for The Muppets I wouldn’t be here -- or anywhere -- today. And I certainly wouldn’t be part of the whole Muppet family. I can honestly say: Before this movie, it was like I didn’t exist. But hey, look at me now! 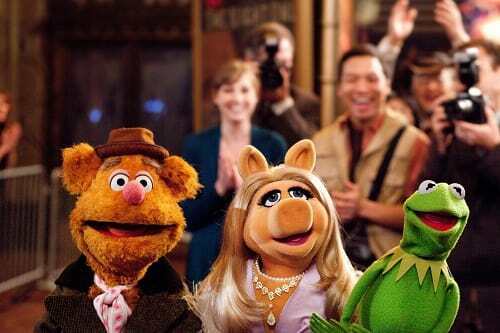 Movie Fanatic: Who is your favorite Muppet and why? 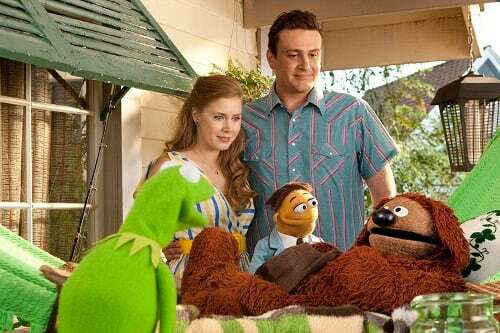 Walter: I love all the Muppets. In fact, I worship the ground Miss Piggy walks on. (She likes that… a lot.) But if I have to choose one Muppet as a favorite, it would be Kermit. He can sing, dance, act, play banjo, ride a bike and somehow put up with all the other Muppets! He’s my role model, my hero… my amphibian idol. Movie Fanatic: Now Fozzie, how was it to get the whole gang back together? Fozzie: It was great! I didn’t even know we were apart, but when we all got together to make the movie, it was just like old times -- only louder. Movie Fanatic: And what was the biggest challenge making this film for you, Fozzie? Fozzie: Same as any movie we make -- the biggest challenge is always making sure you don’t get between Miss Piggy and the camera. Not a good place to be. Walter: Jason and I are like brothers. Just like in the movie, we went everywhere together and did everything together. (If you watch his other movies, you can sometimes see me in the background waving.) It was so much fun to make The Muppets with him… and to know that the Bret McKenzie song that we sang in the movie Man or Muppet won the Best Song Oscar explodes the cool meter. Would I work with Jason again? Absolutely! Why, have you heard something? I’m available. I can start today! Movie Fanatic: Now Fozzie said he had to stay out of Miss Piggy’s way when a camera’s around. How’d you find her, Walter? Walter: Oh, Miss Piggy treats everyone that way. “Hey you!” ”Move it, buster” and “Watch it, weirdo.” These are all terms of endearment from Miss Piggy. I got along great with her, especially when she found out I’d do absolutely anything she needed done -- from getting her dry cleaning to fetching her coffee to cleaning out her pool filter. You may not know this about Miss Piggy, but she really likes to be waited on. Movie Fanatic: Walter, you sing so well in the film, who are your singing idols? Walter: Oh, thank you. I never had a lesson. As for my singing idols: well, Kermit, of course. I’m a big fan of Weezer, OK Go and My Morning Jacket… oh yeah, and Beaker. He’s got a limited repertoire, but if you have a song with “meep” in it, Beaker is the man to sing it. Movie Fanatic: And Fozzie, your comic idols as you’re the resident stand-up artist? Fozzie: I admire all the greats -- George Burns, Milton Berle, Gilda Radner, Lily Tomlin, Bob Hope, Jack E. Leonard, Richard Pryor, Steve Martin, Jack Black and, of course, my all-time comedy idol, Gags Beasley, who still writes most of my jokes. Movie Fanatic: What’s next for you all, another movie perhaps? Walter: Kermit has already asked me to stick around… so I guess I’m part of the troupe. And besides, Miss Piggy still has a really, really long “to do” list for me. What’s next? Hmm, let’s see: I have to go fetch her dog Foo-Foo from the groomers and then go online and blog about how wonderful she is. Busy day!